We love visiting the small storybook villages along the ROUTE du VIN in Alsace. The wines are amongst the world's best-kept secrets and this translates into favorable pricing for those of us who enjoy DRINKING wine (as opposed to those who are merely "collectors"). One trend which disturbs us, however. 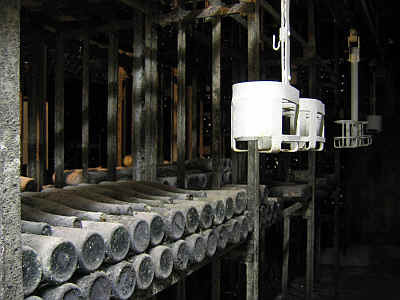 We've noticed many wineries now seem to be making wines with a bit of residual sugar. We can only imagine this is done in hopes of courting ever-more favorable reviews from some of the major American wine writers, whom we've noticed are often oblivious to the sweetness in these wines. As a result, we're finding increasingly higher levels of alcohol and sugar in many of the wines of Alsace. That's fine for "show pieces", but we want wines which we can drink (without having to fasten the seatbelt of the dining room chair)! Each little town seems to be littered with wineries...small signs and display windows beckon tourists to ring the doorbell and come inside for a "degustation" (wine tasting). The region boasts more than 31,000 acres of vines and makes more than 100 million bottles annually. As I noted above, this region is the best kept secret in the vast world of wine. Quality, as in other areas, continues to improve. Though Americans seem to identify the Gew�rztraminer wine with Alsace, we drink far more Pinot Blanc, Riesling and Pinot Gris on our visits there. The locals find the Gew�rztraminer too overwhelming for most foods, save for Munster or Livarot cheeses. The Pinot Blanc or Sylvaner make for nice aperitifs, while good Muscat (and these are usually fairly dry, by the way) pairs handsomely with asparagus starters. With the main plate, we seem to enjoy the Tokay Pinot Gris or crisp, dry Rieslings. Though often more costly than Sauternes, one can find stunning late-harvest wines which are called "Vendanges Tardives" or "Selection de grains nobles". Alsace should be an easier region to understand for Americans as this is one of the few areas in France which tends to label its wine by the grape variety. You'll frequently find the name of the village where the grapes were grown to be somewhere on the wine label. Another feature to add to the confusion...there are some 50 villages with "Grand Cru" status. This element indicates not only a superior vineyard site, but regulations mandate smaller maximum yields as well as requiring higher sugar levels or riper fruit. As production of grand cru status wines totals less than 4% of the region's production, these are, of course, more costly. Further, only Riesling, Gew�rztraminer, Pinot Gris and Muscat had been entitled to this lofty status. 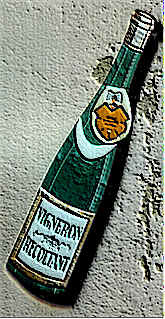 In 2006 the INAO group awarded "Grand Cru" status to the "lowly" Sylvaner grape in one small corner of northern Alsace. The region also produces a simple little blended table wine, called Edelzwicker. This is usually made of odd lots and typically Sylvaner, Chasselas and Pinot Blanc account for much of the blend. Apparently the name translates to something like "the cellar garbage can". Happily, we've encountered a number of these which are not at all trashy! You'll sometimes find these little blends labeled as "Gentil" (we have one from Meyer-Fonne presently that's superb! ), though this designation traditionally refers to wine made from a mixed-planting or field-blended wine. One little difficulty with the wines from this lovely region is that consumers can't tell how sweet the wines are by looking at the label. When you ask various producers about their wines, they often know the exact number of grams-per-liter of residual sugar are in their wines, but this information is rarely communicated on the label. Of course, balance is the key, so a high acid wine with a modest amount of sweetness tastes drier than a low acid wine with a small bit of sweetness. Still, it would be helpful to know which wines are, in fact, dry. A few estates are aware of this 'problem' and we hope they will work to solve this riddle. 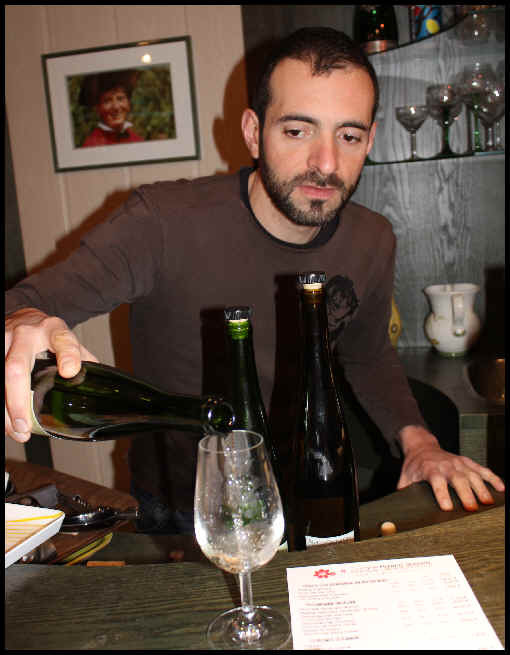 Young Jean Boxler and his wife Sylvie run the show at the family estate these days in Niedermorschwihr, a bit off the beaten path on Alsace's Route du Vin. If you're a connoisseur of the wines of Alsace, though, this place IS on the beaten path and if you know their quality, you'll understand precisely why. The domaine now encompasses some 14.3 hectares and averages about 60,000 bottles annually. The wines at this estate always are a wonderful reflection of the vineyard and the vintage. When we've asked about the style of their wines, the response is usually "that's what the vintage produced." The wines are left to ferment at their own pace...Jean doesn't work to craft the wines to a particular level of sweetness, for example. "When it stops fermenting, it's finished." he explains. As a result, a hot vintage such as 2003 tended to yield wines with more sugar than cooler years like 2002. The Boxler wines have not been easy to find in the US. Well, they're a bit of a hot commodity in Alsace, for one thing. But for years they retained an American importer who preferred to prevent the sale of their wines! We had to guess what wines they might have, since the fellow running the west coast office said he was "too busy to print a list of offerings." Happily that company closed its doors and Boxler wines are imported by someone more sensible. Their wines are highly-regarded and even their competitors are fans of their wines. 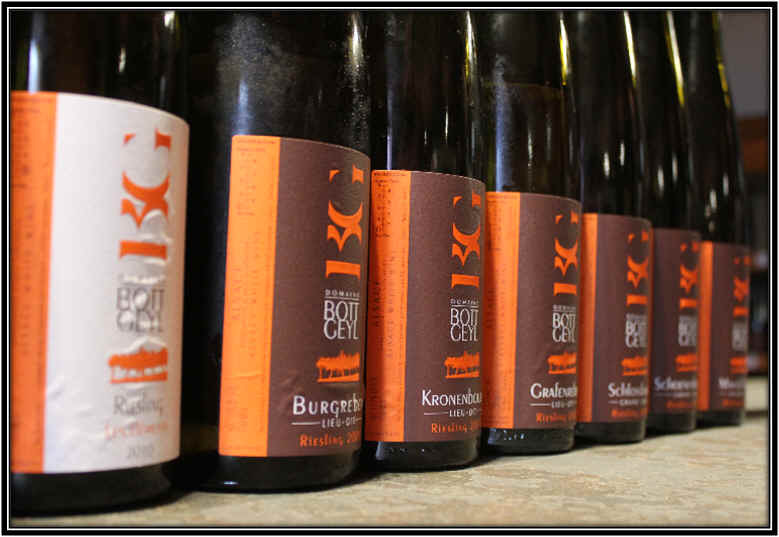 One vintner from a top Alsace winery, visiting our shop said "Oh...you have Boxler's wines. They're really good. I buy them when I see them back at home." Jean Boxler with the Sommerberg vineyard in the background. The Boxlers trace their family tree back to Switzerland in the 1600s. A Boxler came to Alsace and settled in the little hamlet of Niedermorschwihr and they've been there ever since. 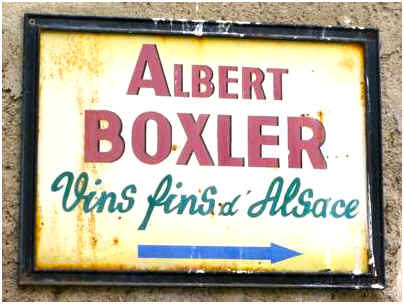 In 1946 Albert & �lise Boxler began a little winemaking enterprise which was taken over by their son Jean-Marc in 1962. He made some wonderful wines and set a good example for his son, Jean (who took over the reins of the estate in 1996). 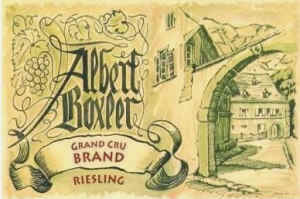 The distinctive label was designed by Albert's cousin, who was a painter...that bit of artistry adorns the bottles of Albert Boxler wines to this day. 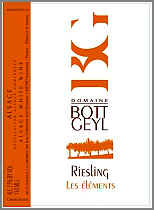 We currently have a beautiful 2012 Riesling in the shop...very fine. It comes from two soil types, granite and limestone. Close to dry. It's an elegant rendition of Riesling and a joy with all sorts of foods, from Asian-styled dishes to smoked fish to sausages and choucroute. If you want to splurge, try a bottle of the 2014 Riesling from the Grand Cru site called Brand. This comes from a vineyard in the neighboring town of Turckheim. There are various incarnations of the story of the Brand vineyard site, all of them featuring a dragon battling the sun. Some claim the dragon lost the battle and was somehow annihilated. Other versions contend the dragon was simply forced into hiding. The point is, though, the hillside that is the Brand grand cru site is of granitic soil. The vines must send down roots deep into this hill, which is south to south-east in its exposure. Add to this that Brand is typically not influenced by the winds from the north and you have marvelous potential. Combine that with the perfectionist viticulture and old-school winemaking and it's no wonder Riesling from this vineyard can be remarkably complex. We have the young 2014 in stock presently. It shows beautiful minerality and some citrus notes. This is already a showy wine and it will continue to blossom over the next decade. The Edelzwicker is amazing. One sniff and you'll agree this could only be a wine from Alsace. Nowhere else do they make wines of this character. This vintage seems to feature aromatic varieties. It's also rather dry and remarkably intensely fruity. We enjoyed a bottle with a dim sum lunch...a wonderful pairing! 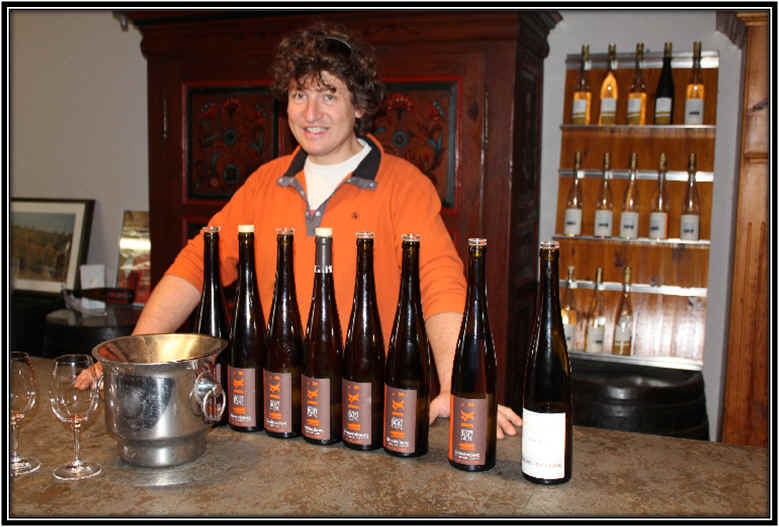 A small domaine in the town of Katzenthal, Fran�ois & Felix Meyer farm something like eleven hectares of vineyards. While not biodynamic, they are moving in the direction of organically-farmed vineyards. They make a full range of wines, including a good, zesty, dry Cremant d'Alsace. We currently have a nice "Reserve" Riesling. The 2013 Riesling Reserve is a bright, crisp, dry white which can be paired with choucroute, sausages, baked ham, shrimp, etc. This was a family-operated winery in the town of Orschwihr, but they ran into major economical misfortune and the place was auctioned off. The new owner is a grower's co-op winery. Wolfberger. That co-op has 450 members and they farm more than 3000 acres of vineyards. Perhaps they had the idea that owning a family-branded winery will allow them to sell more of their Wolfberger wines? A number of years ago we had a client ordering the Albrecht Pinot Gris. We had tasted through the portfolio and never found anything that really shined. More recently, though, we've found the Albrecht brand to have a good example of Gew�rztraminer. It is a classic example with the grapefruit and rose petal fragrances and flavors. The wine has a modest level of sweetness with maybe a percent-and-a-half of residual sugar. This is negated in the company of Thai or spicy Vietnamese cuisine. With a bit of spice, the wine tastes dry. The price is rather attractive, too. This estate is located in the small wine village of Beblenheim. We have fond memories of a summer evening with some good food in a little restaurant there and a few bottles of Bott-Geyl wine. Year later we visited the domaine and met Jean-Christophe Bott who had taken over the family vineyards and winery. He was embarking on a project leaning towards organic farming and now the winery cultivates its vineyards according to biodynamic principles. Today the estate comprises something close to 13 hectares of vines in 60 parcels spread out along the route du vin in more than a half a dozen villages. 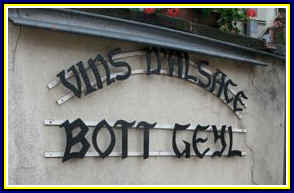 Bott Geyl produces the typical range of Alsatian wines, from rather dry and light to full-bodied and sweet. 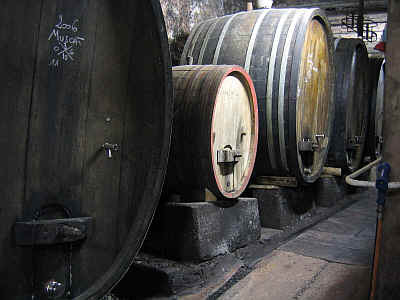 Bott has realized that the character of the wine stems from viticulture and then having good, simple cellar practices. His "Elements" Riesling is a good example of a crisp, mildly minerally Alsace white...the aromas are lightly fruity and floral with a touch of lime. It tastes rather dry and seems to have a good level of acidity. This family-operation turns out about a million bottles annually. 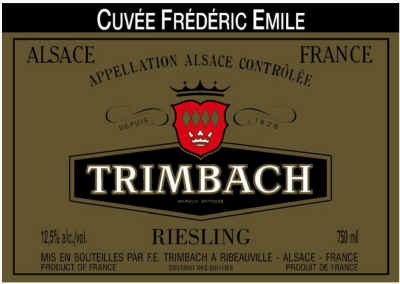 Their wines, along with their large competitors, the Trimbach family, can be found all around the world. As with a winery such as Robert Mondavi, the modest-quality wines are, at least, well-made and periodically rise above that level. They launched a new tier of wines, designated "Jubilee" and these are of greater interest. The winery has been making some outstanding Vendange Tardive wines, but have your credit card ready as these are not cheap. We have access to many of their wines, so special ordering something is not a problem! In tasting through their wine early in 2017 while in Europe, we found every bottling to be "correct" and well made, but nothing was a real standout. We have easy access to a number of Hugel wines. With a few days' notice, we can have these for you. This lovely domaine is in the northern part of Alsace and we first visited the estate in the early 1990s. The wines were just becoming famous, thanks to Roland Schmitt's dedication to making damned good wine. The area was not viewed as being especially prestigious, but Schmitt's penchant for perfection brought a level of attention to detail in the vineyard (and cellar) which was rather unknown in this area. We enjoyed visiting, as this winery was a bit of a discovery. Mrs. Schmitt (Anne Marie) was from Italy, so we could converse with her in Italian, while our German friends spoke their native language as we tasted through the impressive line-up. In those days, the wines had been gaining attention in France, as the quality was high and the prices were imminently fair. In fact, they were not much interested in sending wine to California! They were having trouble meeting the demands of French customers and the wines were finding a nice audience amongst the sommelier crowd in Europe. In 1993, tragically, Roland and Anne-Marie were in a horrific auto accident. He died and she was in a coma for close to a month! We sensed Roland's loss in tasting the wines...there was something missing. But after a few vintages and getting her sea legs under her, Anne Marie righted the ship nicely. Today she's assisted by her two sons. Bruno, I believe, was schooled in history, but eventually decided the family business was interesting and challenging. He takes care of some of the business side of the winery. Julien, though, was smitten early on and he studied enology and viticulture. In fact, he's been the driving force in pursuing organic farming as he feels this allows their Bergbieten terroir to show itself more readily. Julien Schmitt, who looks after the cellar work. The wines here are quite dry and, perhaps, a shade minerally. The domaine covers some 10 hectares, the highlights coming from the grand cru Altenberg de Bergbieten. Farming is organic and the new cellar allows them to vinify with ease and convenience. We currently have a bright dry Riesling...the 2012 vintage...it comes from the Glintzberg vineyard and there's good varietal character. You can pair this with smoked fish, sausages, choucroute (of course) and other delights. Click Here to see My Lunch With Anne Marie. The Trimbach name is one you'll find around the world of wine as, along with the Hugel family, this clan has been a leading ambassador for the wines of Alsace. They are viewed as a large producer in terms of sheer production numbers, but beyond that, their wines are reliable and well-made. We like to support good quality, small, family-operated wineries and so we'd overlooked the wines from this producer, frankly. We have had a couple of opportunities to taste through the Trimbach line-up and each time we've been pleasantly surprised. There's certainly a house style (dry, in fact!) and the overall quality level is impressive, perhaps made even more so when you consider the quantity of wine the Trimbach family produces. The story begins, we're told, in the 1600s, when the first Trimbach ventured 20 kilometers from his hometown, a mining village, to what is now a town along the Route du Vin in Alsace. The family tree shows all sorts of connections with grapes, barrels and wine. 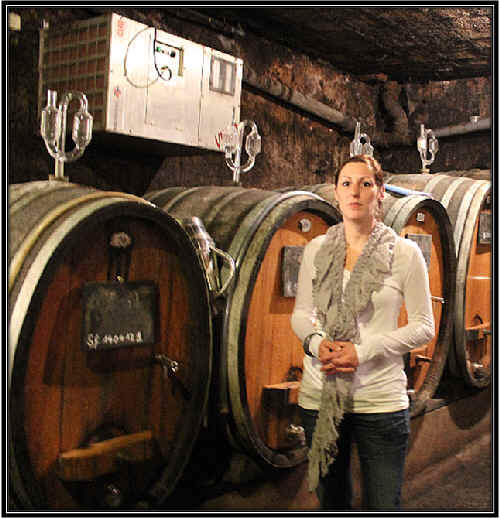 Today the place is run by Bernard and Hubert Trimbach and now Anne Trimbach (the 13th generation!) has recently joined the company. 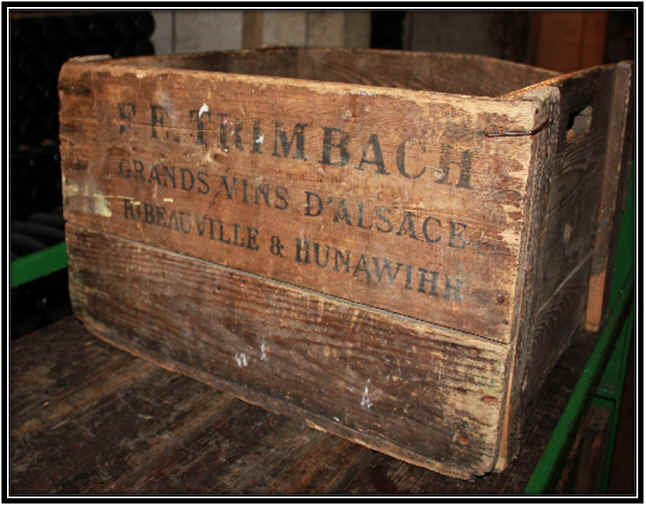 With many vintners bottling "grand cru" wines, Trimbach had resisted that notion, claiming that there are Grand Crus and there are grand crus. 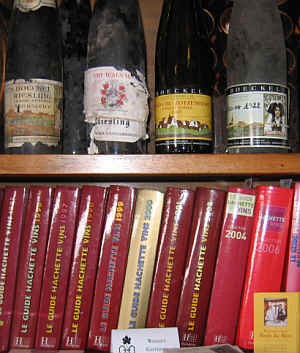 Yes, they've offered a few prestigious bottlings such as their magnificent Clos St. Hune Riesling. 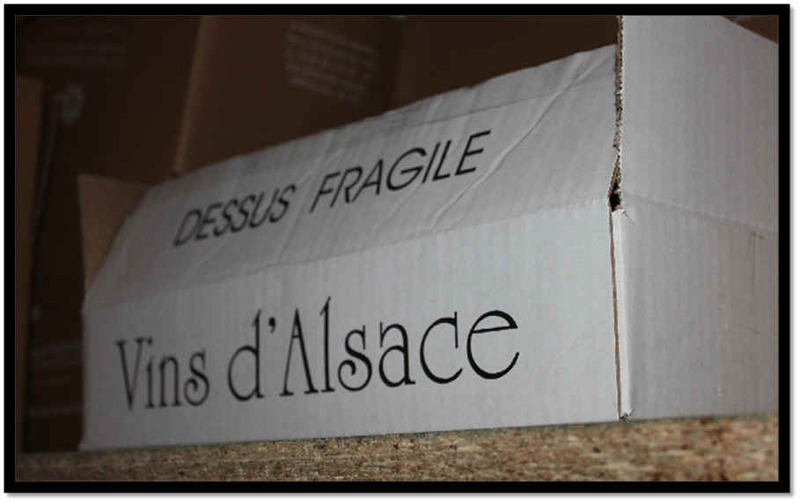 It's an icon for Alsace (or France, for that matter) and comes from a parcel of vines in the grand cru site known as Rosacker, though this is not noted on the label. The wine shows hints of promise in its youth, but which takes years to unfold and blossom into the grand wine you expect when paying such serious money. We have some bottles of the 2006 in stock. We put one on the dinner table recently and it was sublime. That Hugel was quite good, too, so we were not suffering that night. They had a bit of rain in early September in 2006, but you would not know the vintage was problematic. Well, problematic for many vintners. 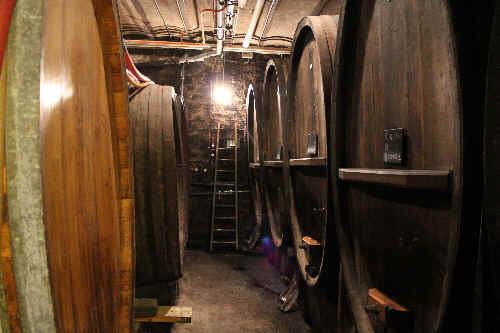 The vintage was a major challenge but good winemakers adjust and make decisions along the way to produce the best wine. Clos St. Hune comes from a 1.67 hectare site and in a good vintage, they'll produce perhaps 8,000 bottles. Anne Trimbach in the cellars of the family winery in Ribeauville. Lots of old, traditional cooperage at Trimbach. Anne Trimbach in the vineyard directly behind the winery. The 2007 is also exceptional. It's got great acidity suggesting this can be cellared, as usual for Clos St. Hune, for another 20-40+ years. It's just starting to unfold and what a grand bottle this is. There are floral and fruity notes, but there's certainly a minerally backbone here. The sugar level is very low and the acidity is rather high, assuring the longevity of this rare white wine. Its price tag is high, to be sure, but compared to what you'll pay for a bottle of Le Montrachet, for example, this is still attractively priced. There's another special bottling called "Frederic Emile" and this is a more affordable wine, if still a splurge for most people. 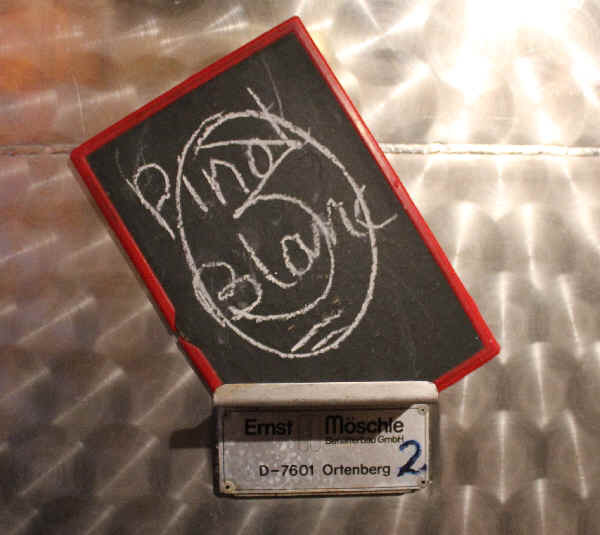 This is grown in a patch located between two grand cru sites, those of Osterberg and Geisberg. It's a wine prized for its austerity, though it does well with age and they often don't release it until the wine is close to 5 years old...Trimbach considers this their "signature" Riesling and, in fact, nearly half the wine they make is Riesling. 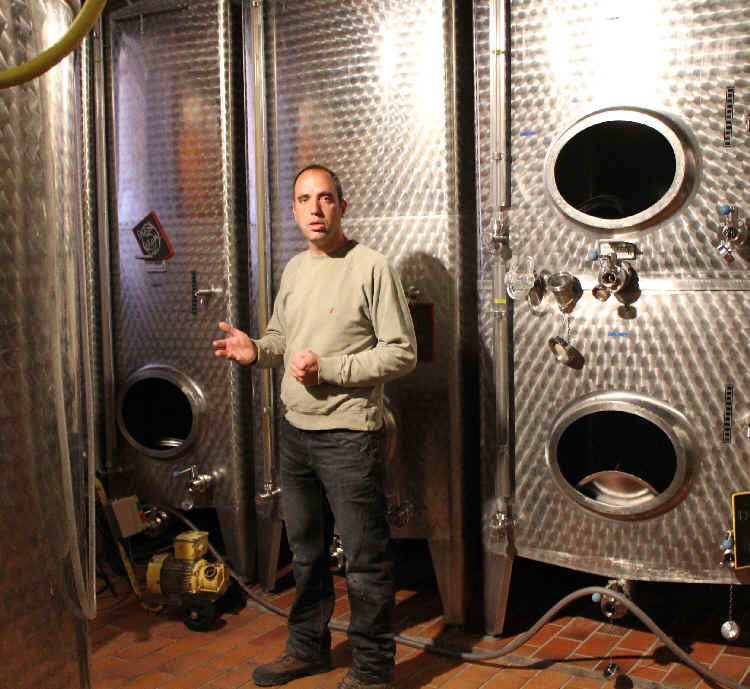 The Trimbach family is not one which follows the current fashion of making wines with residual sugar. In fact, they look to make the wines as stone, bone dry. The Cuv�e Fredric Emile from the 2009 vintage is quite dry and minerally. Think of a streak of lime and stones amidst a floral bouquet. The wine is starting to blossom and will probably remain on a plateau for another 5-8+ years. Maybe longer. They have been leasing a vineyard and working the vines of the Convent of Ribeauvill� for some years. Fruit from the Geisberg site and grapes from another Grand Cru site, Osterberg, goes into the Frederic Emile Riesling (above). In 2009 they kept a small batch of Geisberg and bottled it on its own with terrific results. 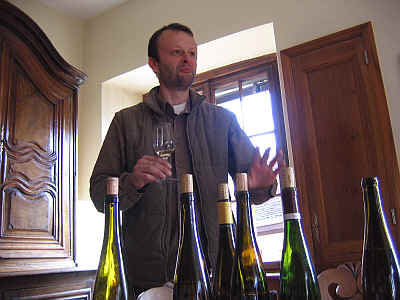 Now they''re in the business of making single, Grand Cru Rieslings! They skipped the 2010 but bottled the 2011 Geisberg as a cru bottling. It's still young, but if you taste this, you'll see it's got a lot of depth already and it will continue to blossom over the next couple of decades. It's a serious bottle of wine, as one might expect. And they now have a Grand Cru Schlossberg Riesling on the horizon. 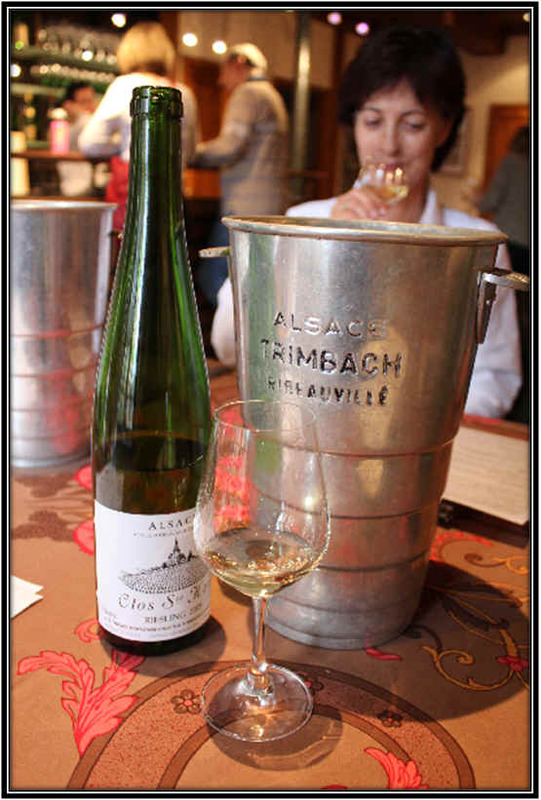 So despite Trimbach being a very traditional winery in Alsace, they are able to embrace change and adjust with the times, though the changes may not be immediately apparent. With many Pinot Gris wines from Alsace being a bit sweet, it's great to find one which is reliably dry. 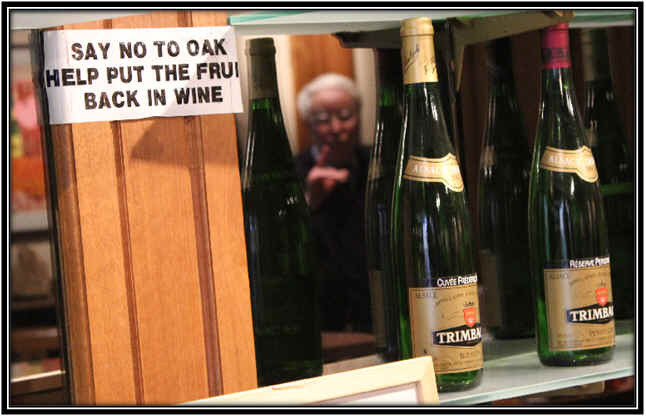 Trimbach's carries the "Reserve" designation and it comes from estate grown and purchased fruit. "We've always made it in the dry, Trimbach style," explains Anne, "and the wine can be a bit austere in its youth and we know it. That's why we give it some bottle age before releasing the wine." There's a Reserve Personelle Pinot Gris, too, though this is not offered each and every vintage and it's actually from the Osterberg (grand cru) site. It's a small production bottling and does have a touch of sweetness. Their basic Gewurztraminer was a real surprise...the nose was classic and hugely fruity with lots of rose petal fragrances. It's not bone dry but the residual sugar is just above most people's threshold for sweetness... The special bottling called Cuvee des Seigneurs de Ribeaupierre is even more impressive with spicy, peppery, grapefruity notes. And of course they periodically produce some late harvest wines which are sweet show-pieces. Pinot Gris and Gew�rztraminer, typically. We also have several Trimbach-labeled eaux-de-vie, so if you'd like a bottle of Prunelle Sauvage, Framboise or Poire Williams, we typically have 'em. 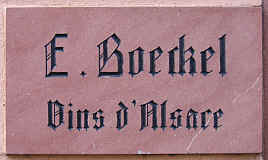 Emile Boeckel is an old family-run estate in the northern reaches of Alsace. I remember my dad used to stock wines from this property back in the Dark Ages when Bay Area wine drinkers only knew Hugel and Trimbach as the sources for wine from Alsace. The Boeckels made good wine and the prices were fair. Some things don't change! The family owns about 20 hectares of vineyards and they buy grapes from an equal number of hectares. Emile Boeckel is the patriarch of the estate and his sons Jean-Daniel and Thomas run the place. 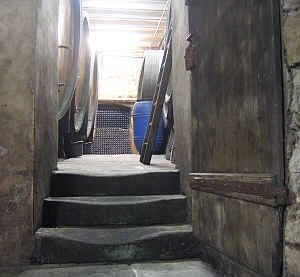 The winery is a curious maze of uneven floors and galleries. If you know the "Winchester Mystery House" here in the Bay Area, then you might call this Alsace's "Wine-chester Mystery Winery." You'll find bins and bins of unlabeled bottles. Back in the late 1950s Boeckel built a track around the entire cellar with these little "baskets" to carry bottles to the labeling machine. Modern when it was installed, it's a charming relic of the past. The French wines made of the Sylvaner variety are usually pretty close to Evian water in terms of character and complexity. Yet the Boeckels manage to make an amazingly good wine from their Sylvaner vineyards. One secret is the vines are old. A second part of the equation is that the vineyard site is in a "Grand Cru" location, except that Sylvaner has not been viewed as a "noble" variety. It had not been able to be sold as a "Grand Cru" wine! 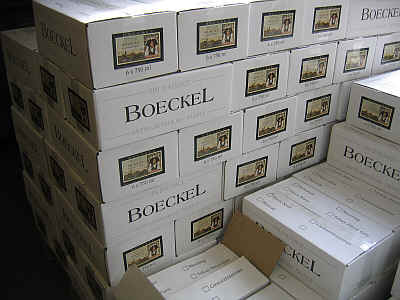 This changed recently and starting with the 2005 vintage, Boeckel will offer a "Grand Cru Zotzenberg" Sylvaner. Get your wallet ready, because surely this means an escalation in price. When you open a bottle of the "Vieilles Vignes" Sylvaner from Boeckel, you immediately will inhale a fragrance that can only be from Alsace. This is what people refer to when speaking about terroir. This wine has plenty of it! There's a minerality and spice tone that is magnificent. We currently have the 2008 vintage in stock and it's most sensibly-priced at $15.99. The wine is predominantly from their Zotzenberg vineyard, the newly-designated Grand Cru site. Wait 'til it says "Grand Cru" on the bottle...then you'll be paying serious money. Jean Daniel Boeckel explaining the 'secrets' of Sylvaner. A recent vintage of Gewurztraminer is a nice example of that grape, as it's mildly fruity and lightly grapefruity. It's not an "over-the-top" sort of wine...good, though.